We are a small, family run teacup Yorkie kennel. We have been raising Yorkies for 12 years. 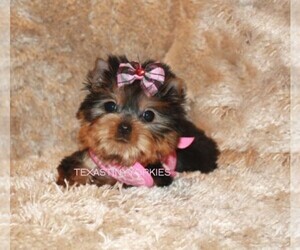 At Texas Tiny Yorkies, we take pride in the beauty and quality of our Yorkshire Terrier (Yorkie) breeders. The quality of our breeders and their pups is unmatched and they will give you the most adorable and unique tea cup Yorkies anywhere.